One way of looking at the Hajj exhibition that has opened at the British Museum is to see it as a documentary investigation of the epic pilgrimage to Mecca that all Muslims must perform once in their lives, if they are able. Another way of looking at it is as a triumph of exhibition hope over exhibition reality: rarely can the BM have tackled a topic for which there is so little accessible content. And there’s a third way of understanding this event: my way. I propose to view it as an accidental but compelling exploration of conceptual art. I suggest this third way not just because the black basalt cube in Mecca that is the focus of the Hajj, the Kaaba, looks exactly like a Carl Andre sculpture, but because so much of the extra­ordinary story line laid out for us by the British Museum takes place in the mind. Take away the faith of the determined once-in-a-lifetime pilgrims who embark upon this momentous march to Mecca and you are left with a black cube. And only an institution as determined to bring proper understanding to the world as the British Museum would have dared to create an exhibition of this import, from this little material. By material, I mean the usual contents of a British Museum show: objects, sculptures, art. Things you can see and admire. The story of the Hajj is largely a story without illustrations. Non-Muslims are not allowed to enter Mecca or witness the Hajj itself. Apart from Richard Burton, who sneaked across Arabia disguised as an Afghan pilgrim, few dispassionate western observers have left a written record of the pilgrimage, let alone a pictorial one. Mecca looms huge in our contemporary imagination, but no non-Muslim can readily picture it. Another complicating issue is the modern Muslim discomfort with art. The museums of the world are full of evidence of the joyous relationship Islam once enjoyed with the visual arts, but the more macabre recent versions of the faith have disgraced themselves with their intolerance. Who can forget or forgive the sickening blowing up of the Bamiyan Buddhas by the Taliban? This modern intolerance has created a situation in which the British Museum is seeking to illustrate a subject for which illustration is not only rare but, in some quarters, actually deemed to be transgressive. The last of the list of obstacles to be overcome by this heroic show is the irreducibly mysterious nature of the Kaaba itself. It may be the focus of the world’s most populous pilgrimage, but few sights in religion are as successfully blank as this plain black cube of basalt. Said to have been built by Adam after his expulsion from paradise, and later restored by Abraham, the Kaaba was once a temple inside which various pagan idols were stored. Muhammad removed them and today the Kaaba defines itself by having nothing in it. Nobody has been allowed to ­excavate it. There are no photographs of its interior. Nothing in this show is able to penetrate ­further than the Kaaba’s implacably minimalist black exterior. The display combats this enforced insubstantiality with words: descriptions, captions, placards, arranged in three texty tranches. The first deals with the geographic difficulty of the Hajj and the various routes that could be followed. The instruction to undertake the great pilgrimage is one of the five pillars of Islam. But getting to Mecca before the coming of the air age was a mighty challenge. One set of camel caravans headed south from Damascus. Another headed east from North Africa. A third came across the waters from the west, from India, and, further still, from Indonesia. To bring these huge migrations to life, the show picks out some telling individuals from the moving masses. I like the fact that Kim Philby’s father, a geographer, converted to Islam and went to Mecca to clean the Kaaba, and that the brush and cloth he used are still preserved by the Royal Geographic Society. Mansa Musa, the 14th-century king of Mali, was another extra­ordinary traveller. Having accidentally killed his mother, Musa made the pilgrimage with a caravan train filled with gold that he handed out penitently on the journey, plunging his country into debt for a decade. In those days, the Hajj would take many months to complete, so in 1900 work began on a helpful railroad that linked Damascus to Medina and cut the journey time down to four days. Until Lawrence of ­Arabia bombed it in 1916. Another notable British contributor was Thomas Cook, who was brought in to reorganise the transport and whose ­company became “agents for the control of the movements of Mohomedan Pilgrims from all parts of India to Jeddah”. All this is entertaining stuff, made vivid by period photographs and the occasional ­news­reel. The final section of the show describes the ceremonies that need to be conducted at the Kaaba to complete the Hajj — the various ritualistic bouts of walking, running, drinking, stoning. The famed Islamic collector Nasser D Khalili has also lent a selection of the sacred cloths in which the Kaaba is bedecked for the Hajj, and these shimmering, wordy textiles finally bring a visceral artistic buzz to the display. One of the strategies the museum has come up with to ­create an exhibition out of the few resources available to it is to include some bits of contemporary art. Kader Attia, an Algerian from Paris, paints the black cube of the Kaaba disintegrating into dripping particles as if attempting a transformation ordered by Jackson Pollock. The Palestinian artist Ayman Yossri shows us a row of trudging desert pilgrims taken from a film about Malcolm X, who undertook the Hajj in 1964. But I think the Saudi artist Ahmed Mater hits something important on the head with a table-top sculpture created with magnets, in which the black cube of the Kaaba sits at the centre of an advancing expanse of iron filings. It’s an image that sums up perfectly the sense you get here of huge waves of human energy, converging unstoppably on a tiny black square. At the Victoria and Albert Museum, a subfusc display has been unveiled devoted to spider silk — yes, spider silk. This show, too, consists of texts, photographs and textiles. But its impact is different enough to feel almost like a deliberate opposite. Where the Hajj display is stern and good for you, the spider show is bonkers: mad, decadent and glorious. It turns out that an angry little beastie from Madagascar, called the golden orb-weaver spider, spins its web from an extra-fine variety of silk. This spider lives in the highlands of the island and bites you if you pick it up. But when the sunlight catches its thread, the air around sparkles with flashes of irresistible gold. For centuries, visiting westerners have dreamt of finding a way to weave this gorgeous but elusive golden silk. In 1709, a Frenchman from Montpellier apparently produced enough to create a suit of clothes for Louis XIV. Later still, Napoleon had some stockings made from spider webs. It was these attempts to achieve the near-impossible that persuaded two modern visitors to Madagascar, Simon Peers and Nicholas ­Godley, to have a go as well. Amazingly, they pulled it off. 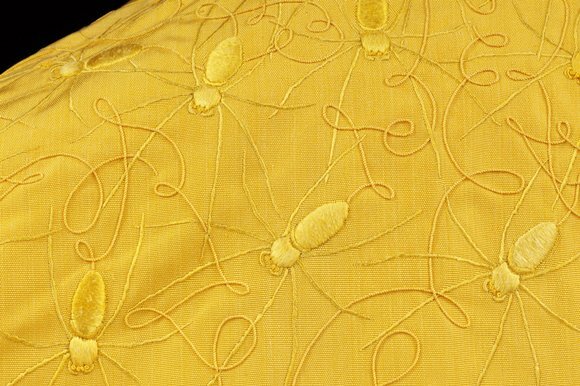 On show at the V&A are the two largest examples of spider silk weaving that anybody has ever completed: a large golden wall-hanging and a circular cape, each made from the silk produced by about 1.2m spiders. The two textiles have taken eight years to create, and if your mouth doesn’t slump with awe at the sight of them, then I am afraid you have lost too much contact with your primitive self and need immediately to go hunting and gathering. Wow. It’s not just the sight of these unfeasible expanses of shimmering gold that is so affecting. The sheer craziness of the enterprise seems also to tell you something important about human accomplishment. Sisyphus rolled a boulder up a mountain; Thor Heyerdahl sailed from Peru to Tahiti in a balsawood raft; and Godley and Peers wove a golden cape out of spider silk.